I have been involved in teaching yoga classes at the Fluvanna Correctional Center for Women since 2010, serving as the coordinator for the program for the past 3 years. Almost every week, I hear from class participants about how much they appreciate the opportunity to practice yoga and how much yoga has helped them cope with the challenges of incarceration. Many have talked about continuing yoga practice after their release. Going to the Fluvanna Correctional Center every week has provided me with opportunities to examine my unknown (to me) stereotypes about “criminals” and about systems designed to reduce/eliminate personal freedoms as punishment. Every time I walk in and out of Fluvanna Correctional Center, I reconnect with a sense of appreciation for my own freedoms and abilities to make choices. At the same time, I reflect regularly on the (mental) prisons that I continue to live inside. I have learned to be more of an observer (hopefully non-judgmental) and less of a “fixer.” I hope I have brought humanizing moments to classes, treating each participant as human beings who have worth and value. So much learned, I am so grateful! We currently need and will continue to need more teachers to continue this program. Please share this with yoga teachers you may know, and if you are a yoga teacher, please consider volunteering at the Fluvanna Correctional Center —it could be a blessing to you, as it has been to me! Please be in touch (email: info at commongroundcville dot org). 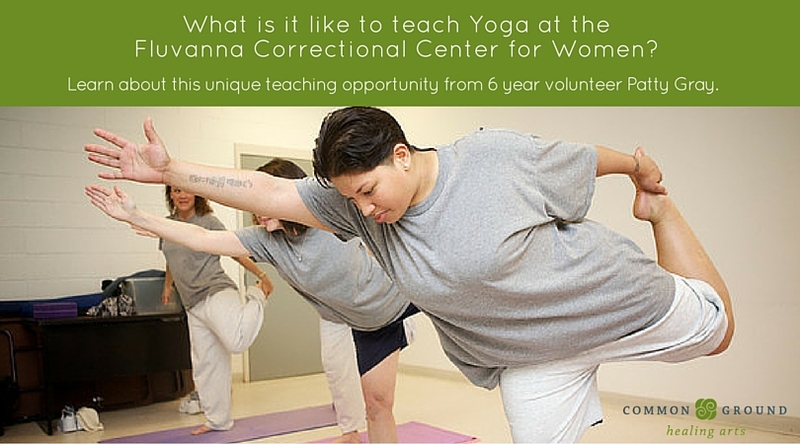 Is there anything needed to sustain the yoga program at the Fluvanna Correctional Center? Teachers who can teach, especially during weekday hours. Ten mats to replace those which have become worn out over the past 6 years. We initially scheduled classes with two teachers, in part to ensure safety. Classes are taught in rooms with large windows and officers are within a short distance. In six years of teaching, we have only 2 instances of disruptions in classes, both of which were quickly managed by officers. For the past 3 years, classes have been taught by one person per class. Designated class participants may serve as “assistants,” demonstrating the poses while the teacher helps students modify or fine tune their alignment. How do I become a volunteer at the Fluvanna Correctional Center? All volunteers must be sponsored by/affiliated with an organization approved to offer services at the Fluvanna Correctional Center. Orientations for new or potential volunteers are held monthly, currently on the first Monday of each month at 1:30 (subject to change). Orientation includes completion of paperwork for a criminal background check (which takes several months to complete). Stay committed while you wait for your approval!! Once you are approved, you go out and have a picture taken for your ID badge (which stays there). You trade your driver’s license for the ID badge when you enter the facility. What do yoga teachers wear to class? There is a dress code which applies to everyone who enters the Fluvanna Correctional Center. The list is long. Jeans are not allowed (including to orientation). I typically wear loose fitting pants (scrubs work well) and a loose fitting t-shirt. How did the yoga program at the Fluvanna Correctional Center get started? In 1999, Kate Hallahan Zuckerman began planning for yoga classes to be offered by volunteer teachers at the Fluvanna Correctional Center, under the auspices of the “Guerrilla Yoga Project,” a group focused on bringing community and donation-based yoga to the Charlottesville area. After permission to offer yoga classes was obtained from the the Fluvanna Correctional Center administration, teachers were recruited and a schedule of classes was developed. We also sought donations for mats and blocks (thanks to all who contributed!). Our first sessions were for six weeks with a 2-3 week break between sessions as well as a summer break. The schedule was designed to address the 200+ women who indicated interest in attending classes. We initially had 2 teachers for each of the 4 weekly classes that were offered (8 teachers! ), with 12-20 students attending each class. Classes were initially held in a large classroom (with tables and chairs stacked and pushed to the sides); the room had large glass windows and officers regularly walked by the class. Tell me about the Fluvanna Correctional Center. The Fluvanna Correctional Center is located in Fluvanna County on Route 250 West and opened its doors to the first offender on April 7, 1998. Designed for up to 1200 inmates, with maximum security capacity, the total acreage of the facility is 103.8 acres. The internal compound has 30 acres. There are a total of 20 structures on the institutional property including four general population buildings, segregation building, medical and mental health building, security and visitation building, food service and vocational industries building, programs and education building, administration building, warehouse, water treatment plant, wastewater treatment plant, among others. The facility includes a 24- hour medical facility, residential care, mental health unit and inpatient psychiatric unit. There are numerous educational and vocational programs offered, including several college level classes and certificate programs. Virginia Correctional Enterprises operates a tailor shop, braille transcription program, document conversion business and optical lab. About Patty Gray – Patty Gray began her practice of yoga in 2005 and currently practices in the Ashtanga tradition under the tutelage of Jennifer Elliot. A graduate of the Charlottesville Yoga Teacher Training program in 2010, Patty is the program coordinator for the Common Ground yoga program at the Fluvanna Women’s Correctional Facility. Her curiosity about healing has led to to a study of yoga therapeutics with Doug Keller and Gary Kraftsow while a fascination with alignment has been nurtured through a 40 hour teacher training program in Ashtanga yoga with David Swenson. Listening to the bodymind and honoring what is present in a given moment are essential to Patty’s philosophy of teaching and personal practice.